Thailand is too elite-oriented and too hierarchical to be successful in its attempts to establish strong democratic structures and culture. They go on to discuss the 2006 coup in light of the interesting lineage of Thai-style democracy and its contemporary manifestations. I see the concept of Thai-style democracy as offering an ideological perspective which may justify the abandonment of representative elections, which is one solution (although a highly undesirable one) to Thailand’s decade-long political crisis. The fit here is perhaps not deliberate, but it is certainly functional for the yellow shirts. And of course, it wouldn’t be one of my lectures without a signature graphic. 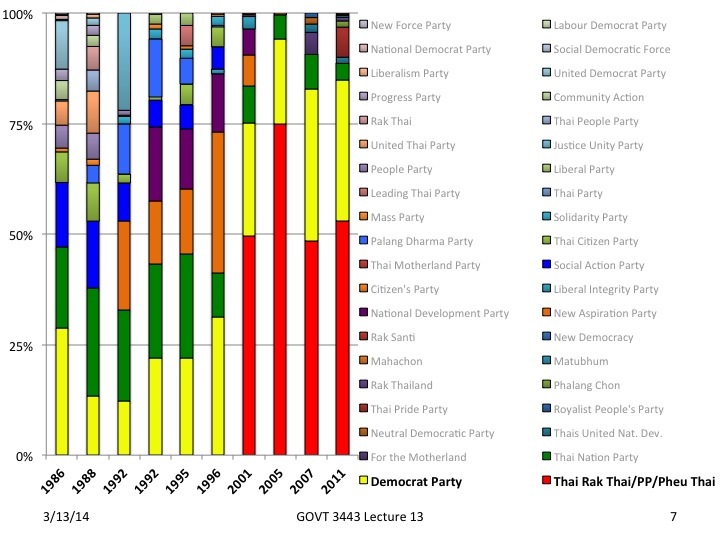 Here it is: the electoral reform of 1997 and the rise of Thai Rak Thai and its successors.